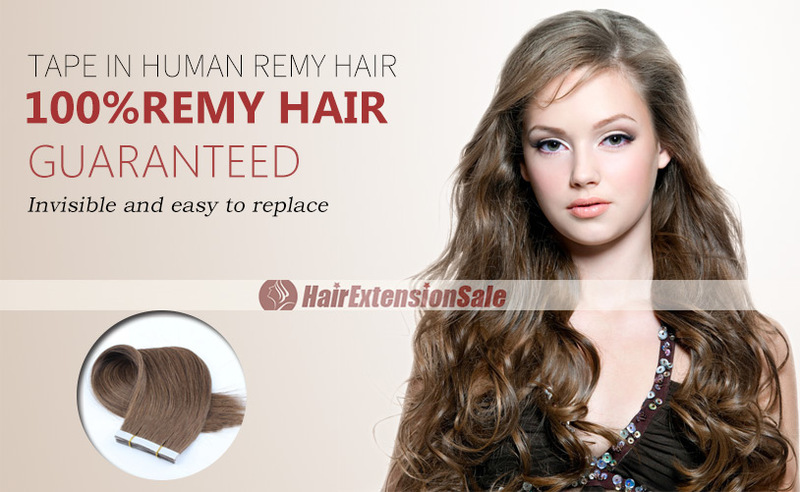 100% remy human hair extensions and very competitive price. Tape on extensions, good flexibility and very strong. Very easy to attach. Can be washed, heat styled. 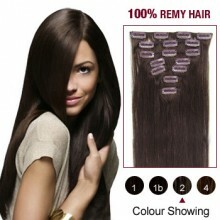 High quality, tangle free, silky soft. Hair arrived today and I put them straight in. easy to fit and very confortable to wear. I recieved my hair extensions only two days after ordering them! They are fantastic!As my hair is coloured, so I was wondering if anyone knows if they are safe to dye to match my own hair??? .. These extensions are very thin and unnatural. The last 4 inches of the hair consists of frizzy tips and split ends. I am so upset that I spent almost $100 on such thin and cheaply made hair. I bought one just to see what it would be like, and loved it, ordered one more because I have thin hair. When I wear them out I get compliments all the time on how gorgeous my hair is. Great quality of hair. Highly impressed. 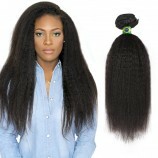 I ordered my hair February 25 its March 21 still no hair. When I try to get in contact with them they don't respond back but when I write a negative review that's when they want to email you to delete your review. I can't get my money back. They cheated me about the buy 4 bundles get 4 free. You only get the first 4 of your choice and they pick the other 4 length. I'm very upset and disappointed with this company, I will never purchase any hair from them ever again. Hello ladies and possibly men? This is my first set of extensions and was actually pleased with what I received. I order the dark brown and yes, it is brown but it is also very shiny so it does give the false hair look if your natural hair is dull. I used dry shampoo on the extensions to make it a little bit dull to match my hair more or you can use baby powder. My husband loves it and couldn't tell where my real hair ended. This piece cannot be used with heat and I recommend you to use a comb instead of a brush because it does tangle easily. I had my hair braided (single braid) for about 7 hours today and when I un-did my hair the extensions were still very straight so it keeps its form. The clips are a little bit too wide for my head surprisingly and I have a rather large head so if you are thinking that this may be an issue I would recommend single clips instead of a full head clip. Overall, I love this piece and wish to purchase more in the future. I hope this helps! Section your hair horizontally in line with the tips of your ears, making sure you start from the bottom of the neck. This will make it easier for you with how to apply tape hair extensions. Start by placing the first tape hair extension into your hair gently. Be careful not to apply the extension too close to the root of the hair. This should allow the tape extension to move and sit comfortably without pulling and causing too much friction between your scalp and the roots of your hair. With this method, you are allowing for the tape hair extensions to also be styled (ponytail or bun updo, tight curls or braids) without forcefully pulling on your roots too much. 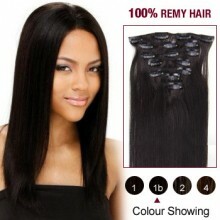 Otherwise, the tape hair extensions could potentially be uncomfortable and unable to style. This could also cause damage or inflammation to the scalp. Raise the first applied extension up, clipping it to your hair bundled on top. Some people are very concerned with how to apply tape hair extensions by this point! 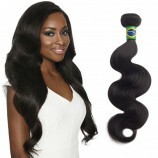 But do not stress too much, it is completely normal for your own hair to attach itself up to the tape hair extension. Take your second tape hair extension and apply it by pressing it tightly against your hair with the first tape extension that you have already clipped up. Your tape extensions are now neatly stuck together with your own hair sitting comfortably in between. 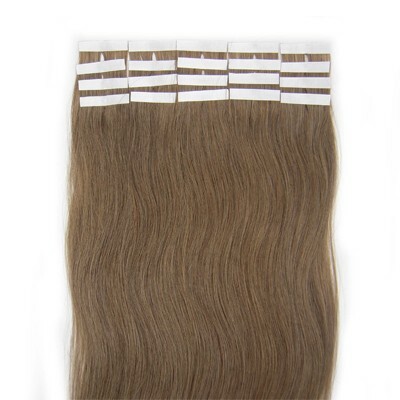 Repeat steps from 1-4, ensuring that the tape hair extensions are sitting side by side with a 1cm distance in between each extension, to also allow for some movement over time. Complete your first row of tape, and then move on to your second row (usually 1 inch up from first row) and work your way up on your head. Keep in mind that if you are placing your extensions too far onto the left and right sides of your head, your tape hair extensions may become visible. Ensure that your tape hair extensions stay covered by your own hair. You have now learnt how to apply tape hair extensions! Keep your hair extensions clean and untangled by taking time to care for them every day. Do not comb or brush the hair extensions while hair is wet. Never sleep with wet hair extensions. Always make sure the hair is dry and pulled up or preferably put into a braid to keep hair from tangling at night. Brush the hair with a hair extension brush several times a day. Be sure to brush properly, holding the roots to prevent pulling on the bonds. Use a wide tooth comb to remove tangles if needed. Use high quality hair care products but don’t overdo it, too much hair care product can cause build up and tangling over time. So you want to be careful with the amount of product you use. Never use any products containing oil, alcohol or ethanol as this can damage the hair extensions and also wear down on the adhesive. Try your best to use sulfate free shampoo and conditioner as well as 100% natural hair products to keep hair extensions in good condition. When working out with hair extensions or swimming with hair extensions, be sure to remove excess sweat and chlorine after working out. When using hot tools be sure to use a heat protectant spray! 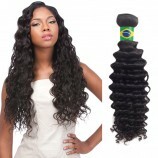 The more you use heat on your hair, the shorter the life-span of the hair extensions. 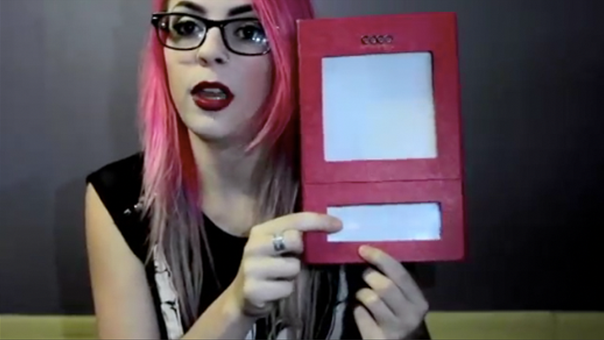 Do not use a flat iron directly on the tape tabs. This will weaken the bond and they will slip out. When using conditioner, condition from mid-shaft to ends only. Do not apply conditioner to your scalp when wearing tape in hair extensions. When using serums or oils avoid contact with the tape, use on mid length to ends only. We use natural products such as coconut oil on the ends of the extensions to keep the hair healthy and shiny over time. Every 6-10 weeks, your hair extensions will need to be reapplied to move the bonds closer to the scalp and to keep your hair healthy. Tape in extensions are not best for those who have lost a significant amount of hair due to any illnesses or for those that have extreme hair thinning. Consult with your stylist about another option. Clarifying shampoo BEFORE going to your stylist is KEY. 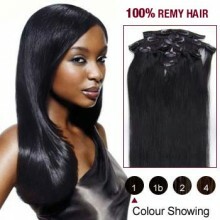 The stylist should also use clarifying shampoo prior to installing the hair extensions. Conditioner should not be used during application of hair. Since a person’s average natural hair loss is between 50-100 strands per day you will see a small amount of naturally released hairs in between the tape bonds at time of removal. This is normal and should not be interpreted as hair loss due to wearing hair extensions. At the end of the day, this hair is gorgeous and so are you! We want to keep it that way! So take care of your hair and you will find out how long they last!